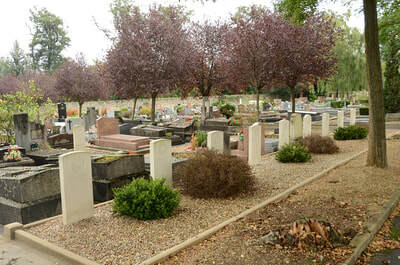 St Germain-en-Laye is 17 kilometres west of Paris. 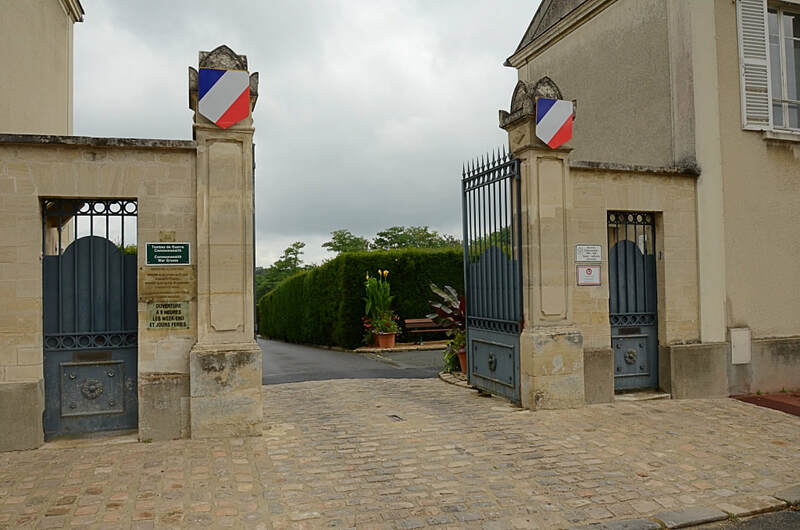 From Paris starting at the car park at the Chateau of Versailles, follow the "Pontaire" route to St Germain taking the Rue des Reservoirs, Bld du Roi, Place de la Loi to the roundabout and then on to Bld St Antoine and Route de St Germain to the D186. Continue straight on, going over the top of the Motorway A13, to the overhead sign Pontaire NR13 St Germain. Continue on the NR13 under the bridge and straight on up the hill. Take the tunnel in the centre of the road and on emerging from this tunnel you will come to traffic lights. Continue straight on and take the third turning on the right. 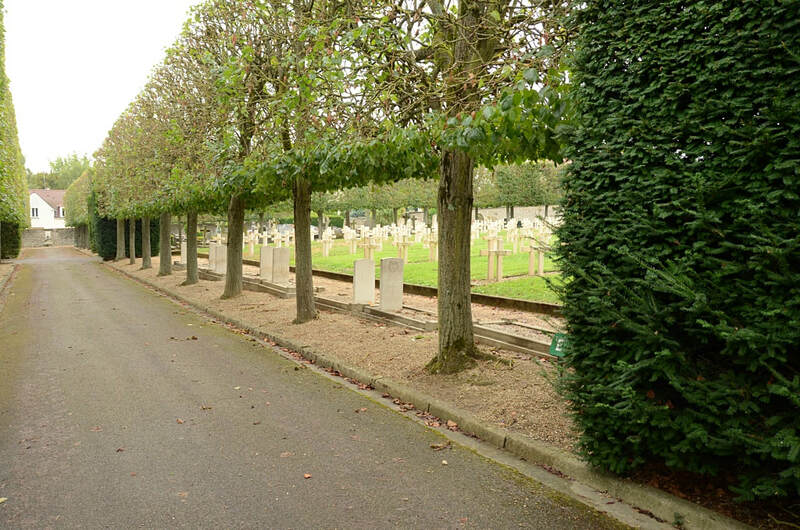 Proceed down the hill to a Stop sign and the cemetery gates will be seen on the other side of the road facing you. If starting from the centre of St Germain-en-Laye at the railway station in the Place Christiane Farhier, take the first road right and then take the second road on the right at the traffic lights - the Rue du Pereire. 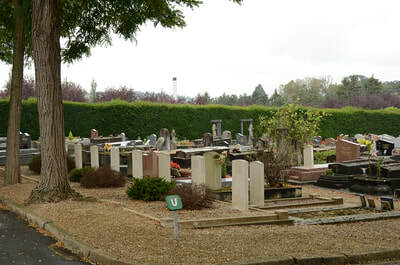 Continue straight on past the second set of traffic lights to the Place du Souvenir Francais and the new communal cemetery will be found on the right. 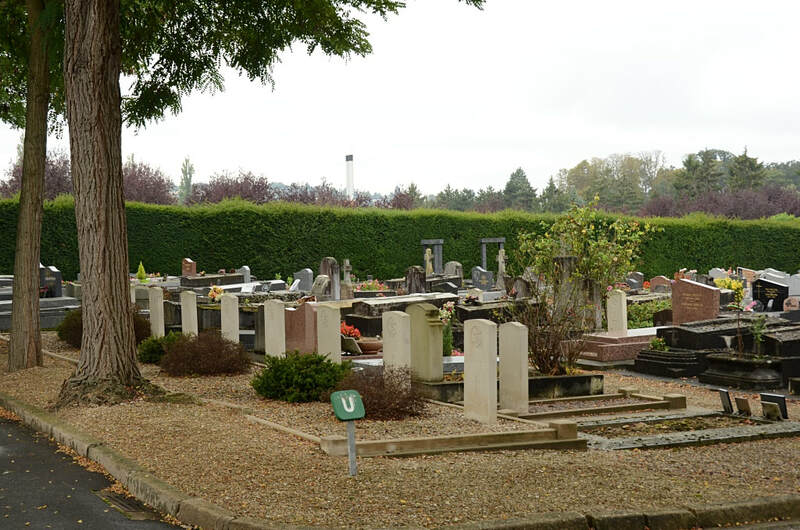 Within the Old Communal Cemetery will be found the graves of two soldiers from the United Kingdom who died in 1914 and 1918. 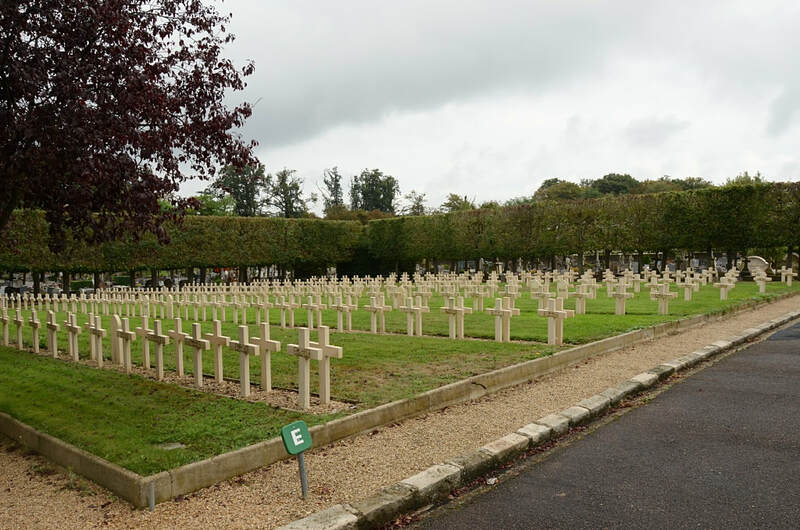 The New Communal Cemetery contains - in a French Military plot near the east end of the cemetery - the graves of three soldiers from the United Kingdom who died in 1914. In the north-east corner is a small plot of nine Second World War burials. Elsewhere in the cemetery are nine post-war service graves. 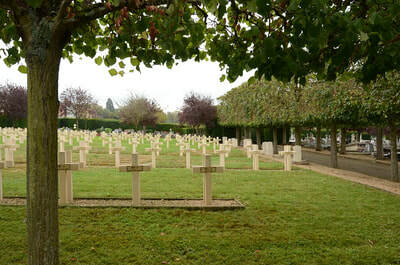 There are now 3, 1914-18 and 9, 1939-45 war casualties commemorated in this site. 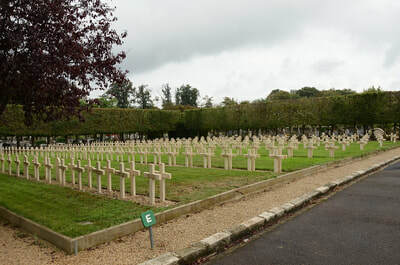 This includes 5 casualties (Admiral Sir Bertram Ramsay and his staff) who were killed, when their Hudson transport aircraft crashed, soon after take-off, whilst en route to Brussels from Paris. 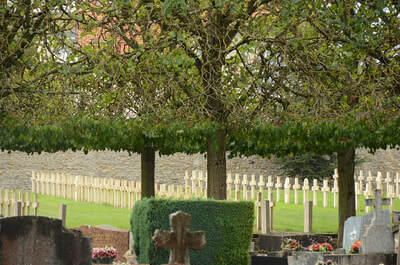 There are also 9 Post War Burials from both wars buried here. 6914 Private J. Brawley, 2nd Bn. 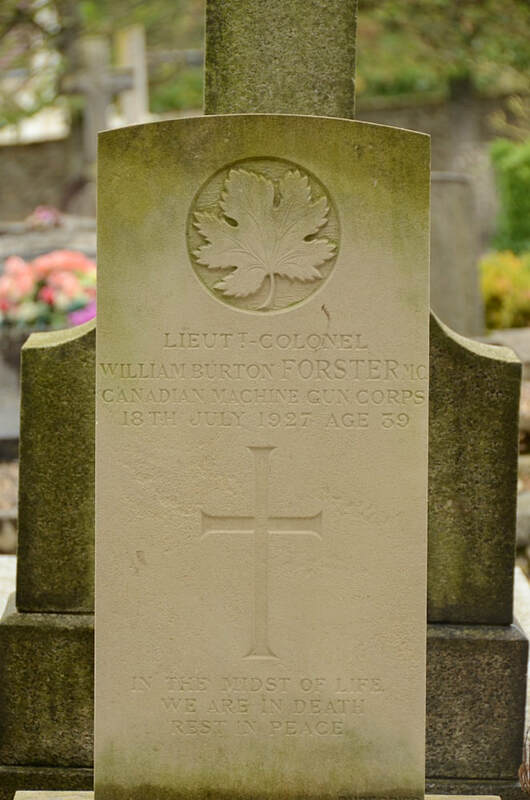 Royal Inniskilling Fusiliers, died 23rd September 1914. Husband of Annie Brawley, of 47, Cown St., Glasgow. 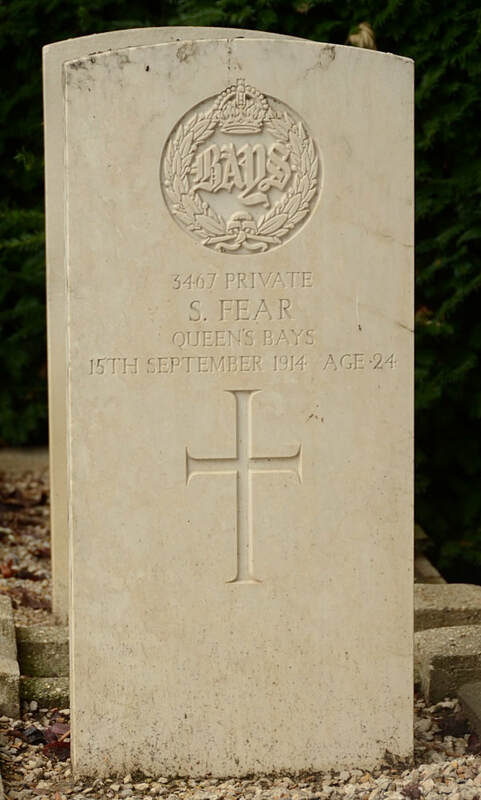 3467 Private S. Fear, 2nd Dragoon Guards (Queen's Bays), died 15th September 1914, aged 24. Son of Mr. and Mrs. S. Fear,of Weston-Super-Mare; husband of Ivy Maud Fear, of 19, Elms Rd., Aldershot. 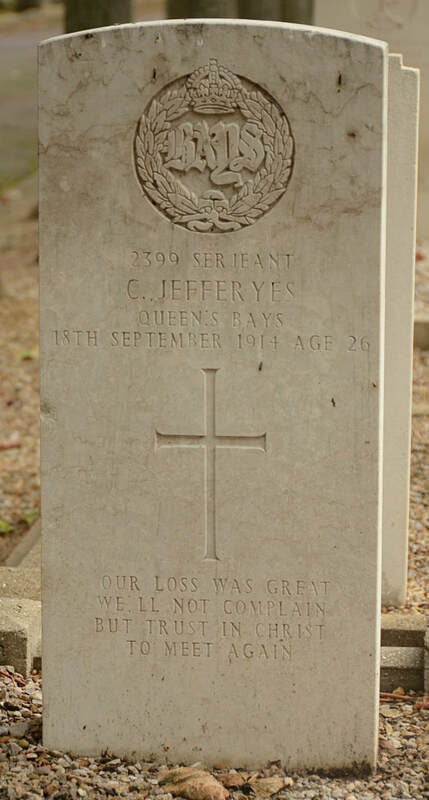 2399 Serjeant Charles Jefferyes, "A" Squadron, 2nd Dragoon Guards (Queen's Bays), died 18th September 1914, aged 26. Son of Henry and Alice Jefferyes, of Norbiton, Kingston-on-Thames. 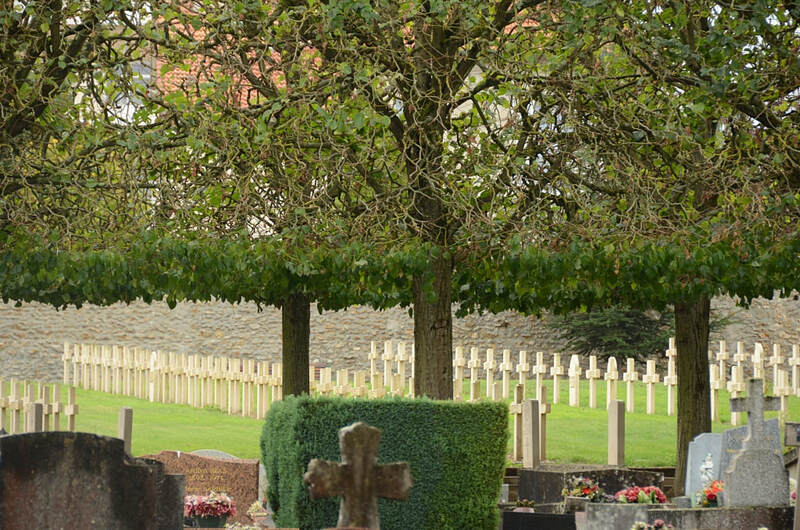 PLY/X 101755 Lance Corporal James Gordon Atkins, H. M. S. Royal Henry, Royal Marines, died 23rd March 1945. 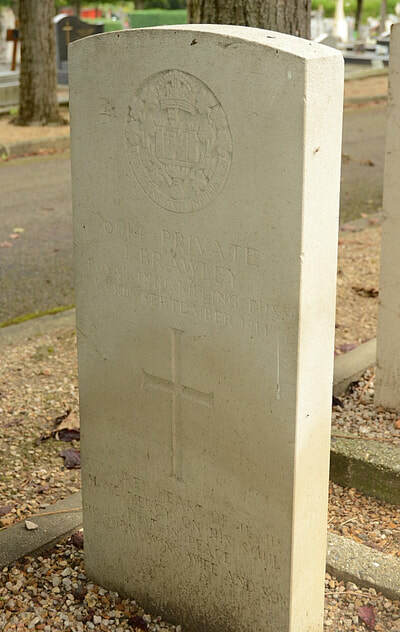 RME/14381 Marine Isaac Richard David, H. M. S. Odyssey, Royal Marine Engineers, died 21st February 1945, aged 22. Son of Mary David, of Aberaman, Glamorgan. INSCRIPTION. MAY THE PLEASURES YOU MISSED ON LIFE'S JOURNEY BE YOURS IN THE GARDEN OF REST. 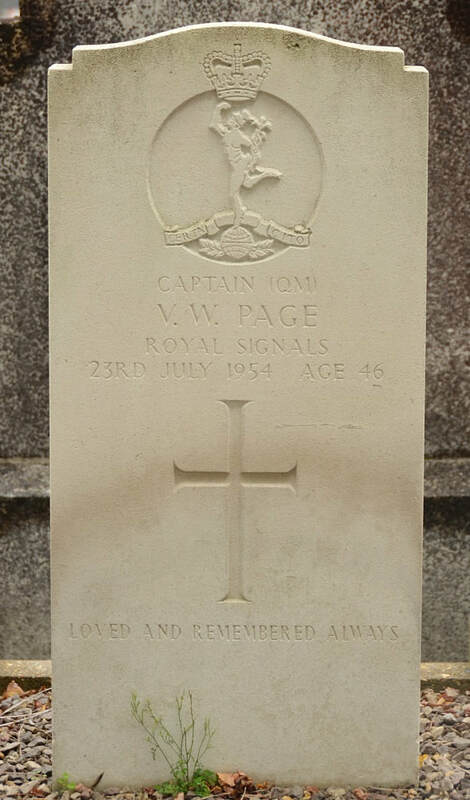 PLY/X 120190 Marine Harold Fawcett, H. M. S. Odyssey, Royal Marines, died 20th November 1944. Lieutenant Derek Malcolm Henderson, H. M. S. Odyssey, Royal Naval Volunteer Reserve, died 2nd January 1945, aged 35. Son of Peter Macniven Henderson and Rhoda Charlotte Henderson, of Westminster, London. B.A., A.C.A. INSCRIPTION. HIS REMEMBERED VOICE FILLS THE SAILS OF THE MIND LIKE A FRESH WIND FROM THE SHORE. Lieut-Commander (A) Sir George James Ernest Lewis, O. B. E. F. A. A. 781x Flt. Royal Naval Volunteer Reserve, died 2nd January 1945, aged 34. 3rd Bt. Son of Sir George James Graham Lewis, 2nd Bt., and of Lady Lewis (nee Hirsch). INSCRIPTION. IS IT SO SMALL A THING TO HAVE ENJOY'D THE SUN?". 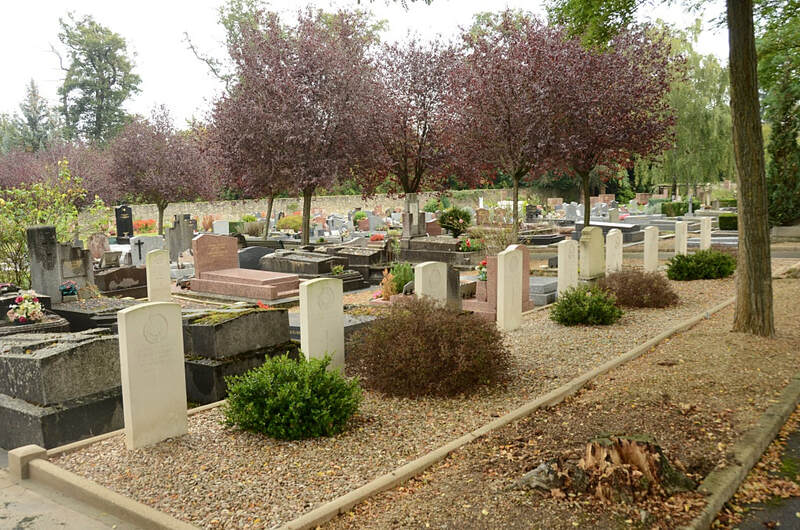 FX81830 Petty Officer David Lewis Morgan, Airman, H. M. S. Daedalus, Royal Navy, died 2nd January 1945, aged 21. 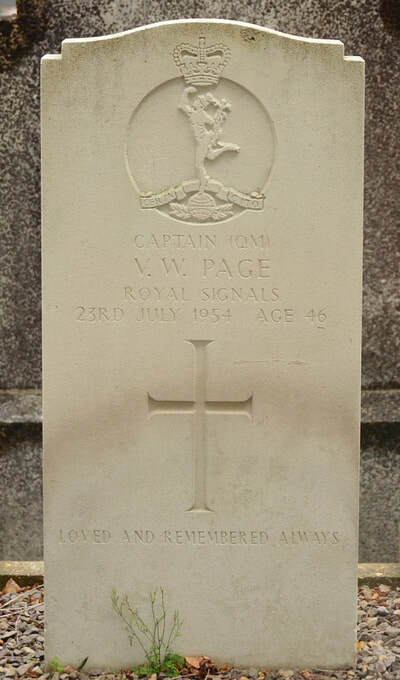 Son of John and Alice Morgan, of Perry Bar, Birmingham. INSCRIPTION. GOD BE WITH YOU UNTIL WE MEET AGAIN. PO/X 2190T Corporal Eli Pendlebury, Royal Marines, died 1st December 1944. Admiral Sir Bertram Home Ramsey, K. C. B., K. B. E. ,M. V. O. Allied Navy Commander in Chief, Royal Navy, died 2nd January 1945, aged 61. Grand Officier Legion de Honneur (France), Commander Legion of Merit (U.S.A.), Order of Ushakov (Russia). Son of Brigadier-General William Alexander Ramsay and Mrs. Ramsay; husband of Lady Ramsay (nee Menzies), of Coldstream, Berwickshire. INSCRIPTION. HE KNOWS HE AT THE END SHALL LIFE INHERIT". Commander George William Rowell, C. B. E., D. S. C. H. M. S. Odyssey, Royal Navy, died 2nd January 1945. 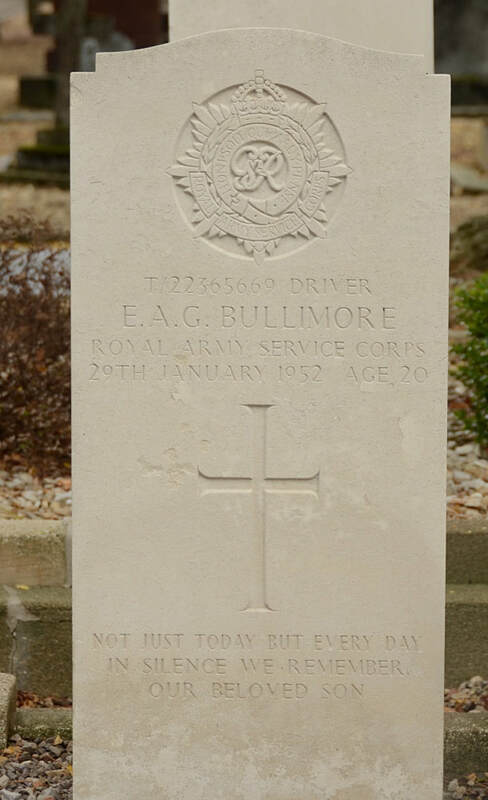 Husband of Daphne Rowell, of Farnham Royal, Buckinghamshire. INSCRIPTION. HE ASKED LIFE OF THEE, AND THOU GAVEST HIM A LONG LIFE: EVEN FOR EVER AND EVER".